Valparai is a sleepy-eyed and fauna-rich town on the Anaimalai Hills range of the Western Ghats. It is one of the few hill stations in Tamil Nadu that is not a total ecological disaster. In the two days that I spent over there in January, I had lady luck dipping a hot-cross bun in a cup of lemon tea and giggling with me. I watched in awe as a Great Hornbill fed his mate as she was incubating her eggs. Encountered a family of Nilgiri Tahrs at 11 AM in the middle of the road. A family of Gaurs passed by me, sizing me up, in a secluded zone. I accidentally scared away a Sambar Deer out of the bushes; minutes later I had an anxious staring contest with a feisty elephant. 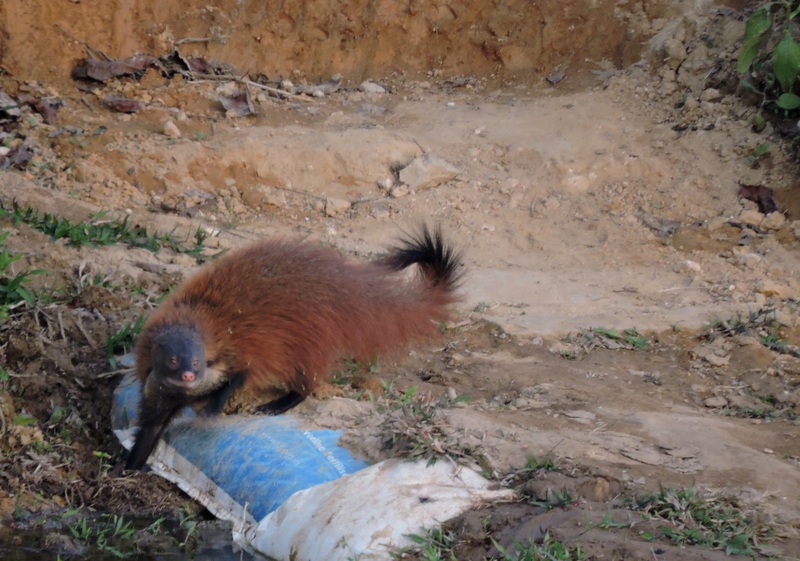 Managed to out-stalk a Stripe-Necked Mongoose. Fall in love with a Plum-Headed Parakeet. Shook my head happily, as Flame-Throated Bulbuls, Streak-Throated Woodpeckers, Malabar Hornbills and many other birdies stopped by. The reason why Valparai is a hotbed for such joyous encounters is that it is surrounded by the Anamalai Tiger Reserve sanctuary. The ghat sections are closely monitored by local and national authorities to keep away the stench of poachers and poorly-advised tourists. The route, past the Varataparai Estate, that leads to Athirapally Waterfalls has many beautiful spots for bird-watching. Although I haven’t had much luck there, I have heard enough wonderful things about the location from conservationists. 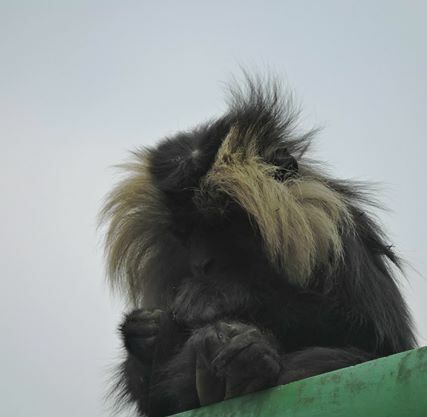 Lion-Tailed Macaques are in abundance though; especially during late mornings and early evenings. However you would be well-advised to stay away from the waterfalls. The place is crowded and more unfortunately creepy. Visiting teenagers and some of the locals are notorious for shooting candid photographs and videos of women bathing in the designated areas. The police and other officials, as I was told, don’t create much noise about it because it will affect tourism. Another intolerable sub-species regularly found in this stretch is the imbecilic feeder of wild animals. If you ever see such morons – no matter the part of the world – please note down their vehicle numbers and report them to the nearest forest check post. Feeding wild animals is a strict no-no. It is awful enough that we wreck their environments. Derailing their hunting instincts out of our apathy and ego is just as horrid. Brilliant as always. Your blog fills me with joy and makes me miss home and also miss it less. Strange but true! Now I have that techno beat in my head. Thank you!!!! Haha! What fun fun fun movie fun fun it must’ve been. Okay am gonna stop now because I have work and it seems we can go like this for hours. There was this swimming pool party and this bond villain pulls out a gun , and suddenly a raccoon wearing a parachute , oh nevermind i ll stop! Your delightfully unique view of life and marvelous command of words makes my mind salivate each time I receive your new posts. You have connected me to your world and I am much bigger for it. Thank you! ah my friend, i write because it is the one of only two things that gives me unfiltered joy. and to have someone connect to it is an exquisite privilege. thank you, i say! Hee hee, a mongoose, I need the whole story too! of course akka, it will be two tales from two kitties! Christy, I’m in awe that you have all this magnificence around you, about the most wild thing we have here is a Ford Bronco. A beautiful written retelling of your adventure, your poem is such a compliment to the body of the post, brilliant. Wonderful presentation! Have a wonderful week.